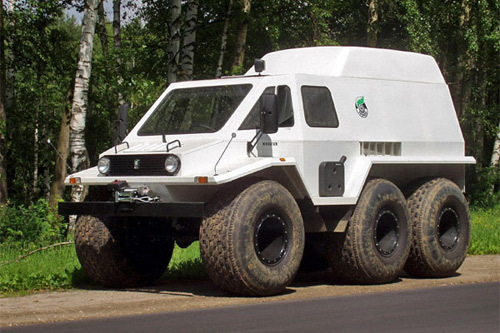 This monster vehicle is clearly on of the most all-terrain vehicles in the world. At least in competition of wheeled vehicles it is king of its category. Trekol uses special tubeless floating tires, thanks to which it reaches extremely good passability trough heavy terrain. Tires makes pressure only 0.1 to 0.4 kg per square centimeter, which is a value, that can be offered only by snow tractors. 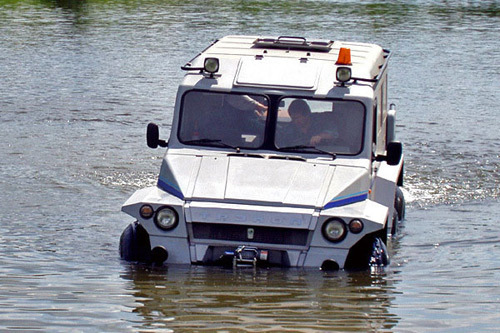 Thanks to the low pressure, Trekol can be used in any terrain, where usual wheeled vehicles can not operate. No matter it is deep snow, mud, sand, swamp, breakable ice or just lake. The only machine able to operate in the same conditions is hovercraft or tracked vehicle. Both are, unlike Trekol, not legal for use on the roads. Trekol dispose of fiberglass bodywork, made of space frame covered with special panels with thermo insulation parameters. Therefore Trekol is able to operate from -60 to +60 Celsius degrees. Vehicle is available in several versions. Basic is four wheel model 3445, able to carry up to 5 people plus 500 of cargo. It is also possible to purchase six wheel version 39294, where you can load up to 8 people and 700 kg. At the road, Trekol is able to run up to 80 km/h speed; it is powered by 2.4 turbodiesel or petrol engine of the same displacement with possibility of conversion to liquid gas power. 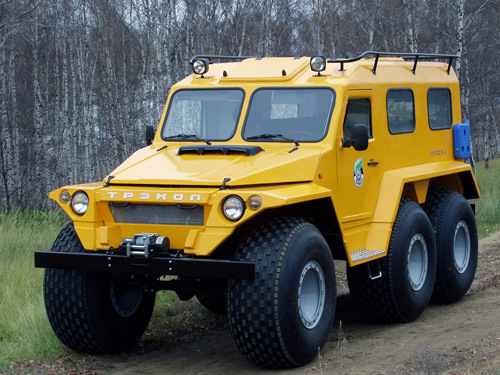 Turbodiesel allows this monster to reach quite positive fuel consumtion – 17 liters/100 km in road/offroad combined use. TTrekol is truly unique piece of machinery, with which you will easily pass the water or any other terrain. Vehicle is legal to be used on the public roads, and in Russia it is being classified as a SUV!